Cognostics are univariate statistics (or metrics) for a subset of data. When paired with the underlying data of visualizations, cognostics are a powerful tool for ordering and filtering the visualizations. add_panel_cogs() will automatically append cognostics for each plot player in a given panel column. 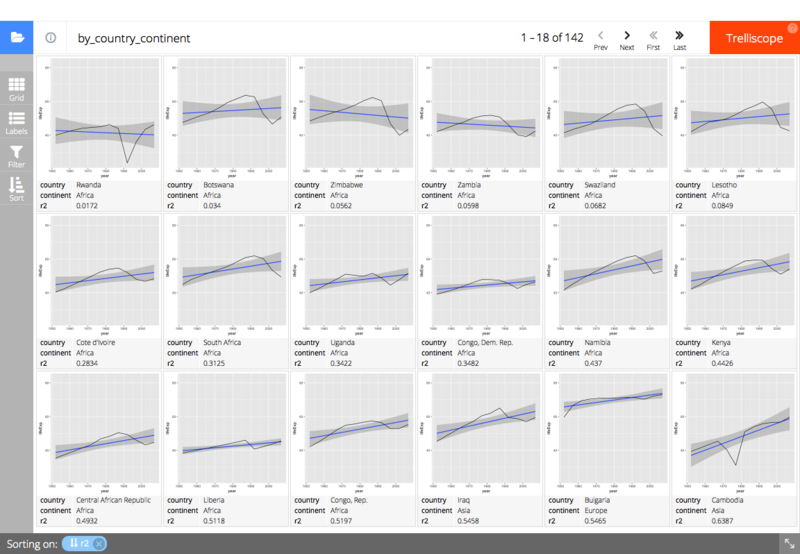 The newly appended data can be fed into a trelliscopejs widget for easy viewing. 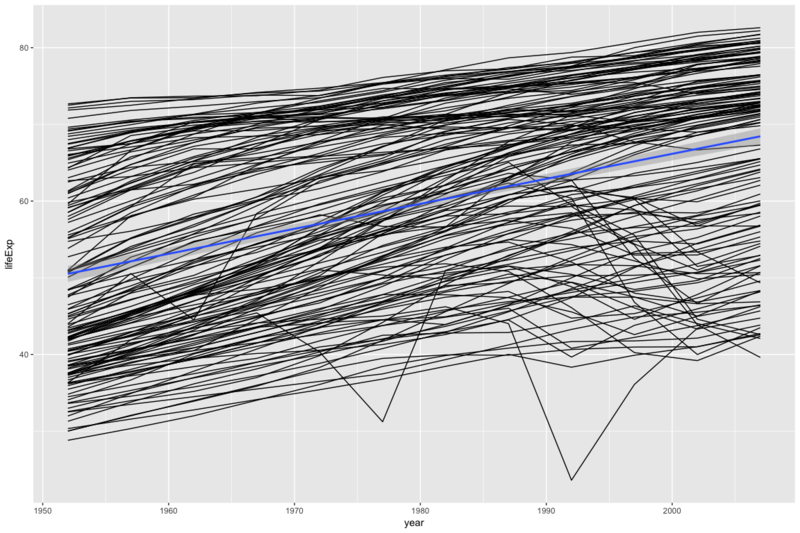 Looking at the plot above, most countries follow a linear trend: As the year increases, life expectancy goes up. A few countries do not follow a linear trend. In the examples below, we will extract cognostics to aid in exploring the countries whose life expectancy is not linear. This is a full, start to finish example how automatic cognostics could be inserted into a data exploration workflow. 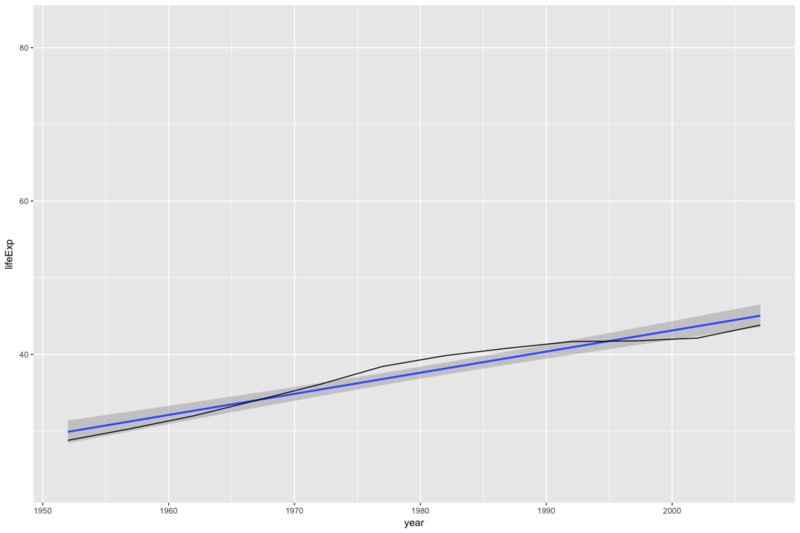 #> Warning: Removed 4 rows containing missing values (geom_smooth). #> Warning: Removed 8 rows containing missing values (geom_smooth). add_cog_group() to add a custom cognostics group. add_layer_cogs() to call which cognostics groups should be executed for a given plot layer. Using existing code from the autocogs package, we will add the univariate continuous cognostics group. We can then call the 'univariate_continuous' cognostics group whenever a geom_rug layer is added in a ggplot2 plot object using the code below.